​The worsening political and economic circumstances in Ukraine has prompted the Fitch Ratings agency to downgrade Ukrainian debt from B to a pre–default level CCC. This is lower than Greece, and Fitch warns of future financial instability. “Intensification of political and economic stress is such that default on government debt becomes probable,” Fitch said in an e-mail. On the brink of default, the Ukrainian economy has taken a further beating as protests drag on in the capital Kiev. Foreign debt is $140 billion, nearly 80 percent of the country’s gross domestic product. “There are emerging signs of stress in the banking system. Demand for foreign currency cash has risen, potentially leading to further steep exchange rate depreciation. These developments pose liquidity and asset quality risks, given the large amounts of foreign currency debt on private sector balance sheets,” the note said. The Ukrainian Central Bank is tapping into the country’s reserves to pay off the country’s fast-accumulating debt. Foreign reserves shrank 12.8 percent to $17.8 billion in January, the lowest since 2006, according data published by the central bank. Overall in 2013, international reserves dropped 16.8 percent, losing a total of $4.1 billion. The central bank is intervening on behalf of the hryvnia, which has fallen significantly as President Viktor Yanukovich and the opposition fail to strike an agreement, and protesters continue to clash in Kiev after 3-months of unrest. 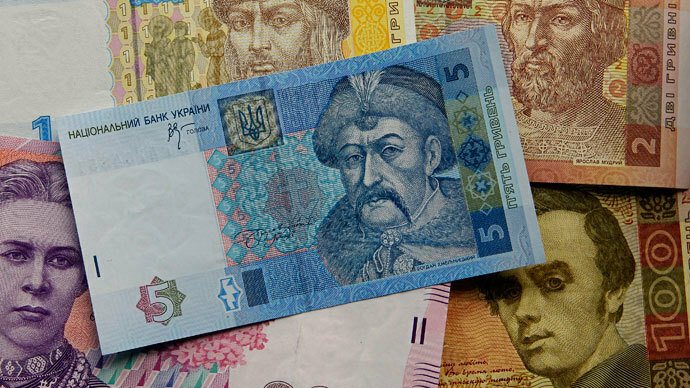 Limits on foreign-currency purchases have been set in order to protect the hryvnia, which has spiraled into freefall, rising above 9.0 against the dollar for the first time since February 2009. At 16:30 MST Monday it was trading 8.4350 against the dollar. If the situation continues to unravel, more capital controls could be introduced to limit the amount of foreign currency bought, or even moved outside Ukraine. 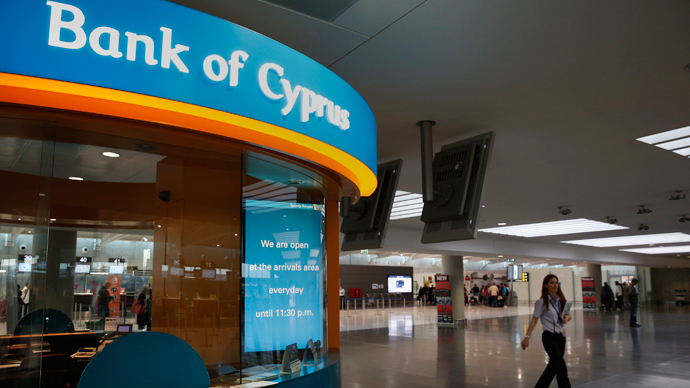 This is the action Cyprus took when it faced default in March 2013. Ukraine’s $15 billion loan from Russia has been put on hold until a new government is formed. A transfer of $3 billion in Eurobonds has already been placed, but the uncertainty over when the next installment will come worries Fitch. “We no longer assume the Russian loan will be disbursed in full, while Ukraine has lost external market access,” Fitch said. “Fitch has previously warned that further Russian support is likely conditional on President Yanukovich’s continued political survival,” the statement said. Mykola Azarov resigned as Prime Minister at the end of January along with many other top government officials. 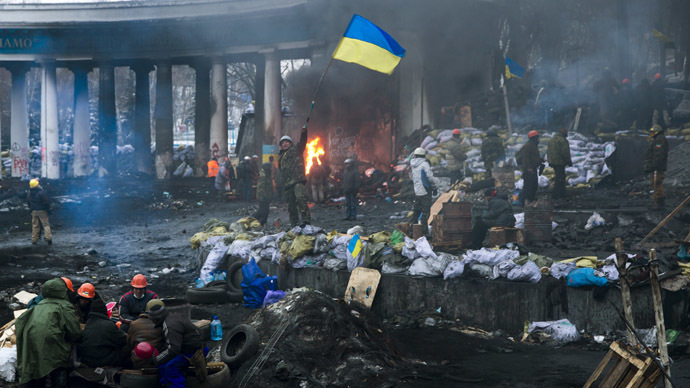 Standard & Poor’s and Moody’s Investor Services have both reduced Ukraine’s outlook. Violent protests have plagued the country since November, when President Yanukovich refused to sign a trade treaty with the EU, and instead in December turned to Russia for monetary aid. 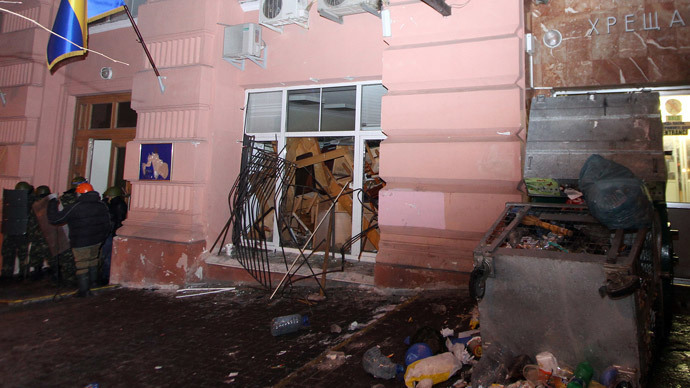 As the currency weakens and foreign currency reserves are depleted, Ukraine may become more dependent on Russian aid. Both the US and the EU have pledged monetary assistance to Ukraine, but no official offers have been inked.